Once the first railways had been established in London (see Beginnings), lines grew rapidly in the 1840s, the years of “railway mania” when dozens of new lines were proposed each year. This was an era much like the dotcom boom of the late 1990s, when even the most fanciful schemes attracted willing investors. Like the dotcom boom it had its inevitable crash in 1848, in which railway shares fell by a third. But if investors lost money, the infrastructure still remained – much of it to this day. One of the earliest lines was the London and Brighton Railway, which branched off from the London and Croydon Railway at Selhurst, and headed south for the coast. This was already a popular route even before the railways, as Brighton was a major town of 46,000 people (a very large population for those days), an important short break destination for wealthier Londoners, a centre for sea bathing and an embarkation point for cross-channel paddle steamers to Dieppe (which operated from the town's chainlink pier, opened in 1820). In the late 1830s there were 36 horse-drawn coaches plying the route every day, taking from four and a half to six hours. By contrast the countryside between London and Brighton was sparsely populated. Redhill, Hayward's Heath and Hassocks did not exist - they are railway creations. On the coast Lewes, Hastings and Hythe were the only places of any size between Brighton and Dover (Eastbourne was just a few houses). In the other direction the only towns between Brighton and Portsmouth were Shoreham, Worthing and Chichester. Because of this Brighton was regarded as a key prize by early railway companies and no fewer than six projects were presented to parliament (whose approval was - and still is - necessary to get any railway built). The line might have been built via Leatherhead and Horsham or via Oxted and Lewes, but in the end the London & Brighton's proposal won. It was for a railway on the current route, with coastal branches to Shoreham and Newhaven. The company was incorporated by Act of Parliament in 1837 and construction began in 1838. The first section to go into service, in 1840, was from Brighton to Shoreham, which was easier to build because Shoreham was a port and so construction materials could be brought in by sea. 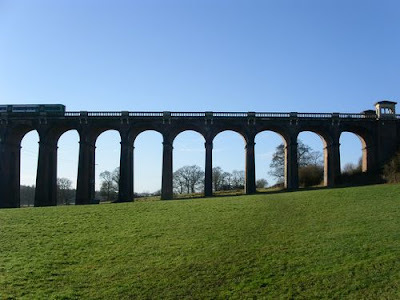 Meanwhile work was going on on the big civil engineering projects of the London to Brighton route, including the Merstham Tunnel through the North Downs, the Clayton Tunnel through the South Downs and the Ouse Valley Viaduct (pictured) just south of Balcombe. The winter version of SWC Walk 22 Balcombe Circular passes right underneath this magnificent brick structure, which still carries the main line, but is today a bit of a bottleneck on the Brighton line as it only carries two tracks. Though it is not obvious today, the engineers also had to contend with quite considerable gradients. The line has three summits - the Merstham and Clayton Tunnels and Balcombe - and in the days of steam the trains spent a lot of energy puffing up to them. More powerful electric trains now make the route seem almost flat. The Ouse Valley Viaduct was completed in March 1841 and in July service started from London Bridge to Hayward's Heath, with Brighton following in September. Initially there were six trains a day, taking two and a half hours each. Right from the start there was a first class only express to London Bridge in the morning which stopped only at Croydon and took one hour 45 minutes. As early as 1845 there were first class season ticket holders using it. Further developments included Shoreham to Worthing in 1845, and both Worthing to Chichester and Brighton to Lewes and Hastings in 1846. In the same year the London and Brighton Railway merged with the London and Croydon to become the London, Brighton & South Coast Railway. In 1947 the cut-off route to Lewes via Plumpton was opened and the coastal line reached Portsmouth. In 1849 a branch was built from Polegate to Eastbourne starting its development as a seaside resort. 1947 also saw the opening of the line from Lewes to Newhaven, which the LBSCR began to develop as a port. Two decades earlier George IV had vetoed plans for a harbour at Brighton the grounds that it would muddy the waters for sea bathing, so, as noted above, ferries to France operated from Brighton's chainlink pier. Newhaven now took over that role, with paddle steamers to Dieppe operating from 1947-8 and then from 1853 onwards. A later expansion of the port also saw its railway line extended in 1864 to Seaford. Hopes that Newhaven would become the "Liverpool of the South" were never realised, however. A number of stations on these LBSCR lines were not in the places we now know them. The original Lewes station was at Friar's Walk, right in the heart of the town (near the top of the pedestrian precinct at the bottom of the town). It was moved to its current location in 1857, but the old station remained in use as a good depot until the 1960s. The LBSCR's Hastings station was some way to the west of the town on the western edge of St Leonards and was known as Hastings & St Leonards, changing to St Leonards West Marina in 1870. Remarkably, despite the later history of the Hastings stations, which is recounted in Bitter competition - and its benefits, this inconveniently sited station remained in service until 1967. The original Bishopstone station on the Seaford branch was in the middle of the marshes east of Newhaven, where there was a tide mill until it was destroyed in the Second World War. It was said to produce the lowest revenue of any LBSCR station. It was moved to its present location in 1938 but the platforms of the former station can still be seen. On the line from Brighton to Portsmouth the original Hove station was nearer to Brighton: it became a goods depot in 1880 and then was known as Holland Road Halt from 1905 to 1956. Today's Hove station was opened in 1865 as Cliftonville, taking its current name in 1895. Other lost stations include Kingston near the mouth of Shoreham harbour, which closed in 1879, and the original Littlehampton station, which was on the coast line to the north of the town but closed in 1863 when the branch line was built. Bognor likewise had a station just to the west of Barnham until 1864, when a branch line was built to the town. Ford was called Arundel until the current line past the town opened in 1863. The London, Brighton & South Coast Railway goes on to play a large part in the creation of the lines we use as walkers. For more details see Lines we lost and A miraculous survivor. Meanwhile, Terminus wars details how it came to start services to Victoria station.